Poverty and drought have been cited as the major drivers of child marriages in Chipinge as early marriages continue to ruin young girls' future. Chipinge, one of the country's hot-spots in terms of women and child rights abuse has had successive droughts since 2005 and this has not been good to young girls who for tradition's sake have been married off before they reach 18 years. 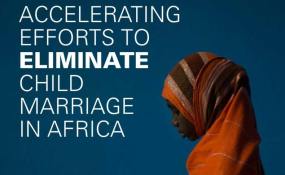 Platform for Youth Development (PYD), an organisation leading a campaign to eradicate child marriages, says a research study it conducted came up with appalling figures on the extent of the vice in communities such as Chibuwe, Mabee, Chinyamukwakwa and Chisumbanje among others. "We have been working in Chipinge communities and can authoritatively tell you that at least four in every ten mothers were married before they reached 18 years," says Cynthia Gwenzi, PYD's Gender and Advocacy Officer. She adds that her organisation has a big role to help these victims and to challenge the practice which has been normalized. According to the organisation, early marriages are a major hindrance. Catherine Vhutuza from Chibuwe in ward 20 of Musikavanhu constituency notes that child marriages are indeed a problem in her community, calling on government to act and address the problem to save the girl child. "Most poor families in Chibuwe cannot afford to send two or three children to school simultaneously, so they end up prioritizing boys ahead of girls and this is the reason why you find so many children being married before they reach 18 years of age," she said. Her sentiments were echoed by Netsai Sithole from Checheche who said national statistics on child marriages were not a correct reflection of the situation in her area as there are more cases than reported. Sithole says little is being done to counter this social problem, although she appreciates the efforts of PYD saying resources and stakeholders are needed to address the problem. "It is good that something is being done now but I believe the intensity of the problem calls for a multi-faceted approach because some of the victims are not willing to open up about their experiences," says Sithole. Chipinge South Member of Parliament, Enock Porusingazi, while addressing a Child Protection Committee meeting in Mabee village said those who break the law should be arrested as no one was above the law. According to Plan International Zimbabwe, "Child marriage violates the fundamental human rights of girls and boys, but disproportionately affects girls. Girls are denied their right to a consensual marriage, as well as their right to an education, protection, economic engagement and reproductive health care. Through its flagship 'Because I am a Girl' campaign, Plan International has been working with communities including Chipinge to educate traditional leaders, media and national governments about the dangers of child marriage. Zimbabwe joined the AU Campaign to end child marriages in mid-2015. The Ministry of Women's Affairs, Gender and Community Development with support from UNICEF, UNWOMEN, UNFPA, the Child Rights and Women's Rights Coalitions has been working on a National Action Plan to End Child Marriages and its related communication for development activities. The Constitutional Court ruling of January 2016 has been an impetus to move the agenda forward. All these efforts are part of the global campaign to end child marriages.